If you land on Stansted Airport, but plan to visit the most popular touristic objectives in London, then we would recommend for you to use one of the means of transport that are mentioned at the end of the article and head towards a central accommodation. If you have a larger budget for this British holiday, you can choose a more luxurious hotel that will eliminate any trace of stress. 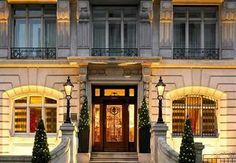 One example is the famous London Marriott Hotel Park Lane, a five stars accommodation, located right in the heart of London. Besides the extravagant facilities and superb interior design, you will be thrilled to find out that you will be staying at a walking distance from the most interesting landmarks. British Museum, Buckingham Palace, West End area and Oxford Street are just some examples of means of entertainment that will turn your holiday into an exquisite one. In order to get a Stansted to London Marriott Hotel Park Lane Transfer by rail there are three main options. First of all, you could take the train from Stansted Airport (every 15 minutes) via Liverpool Street Underground (every 5 minutes), followed by a 2 minute walk. This journey will take about 1 hour and 2 minutes in total. The second option is a bus from Stansted National Express (five times/day), ending with a 1 minute walk. This journey lasts about 1 hour and 16 minutes. The last minute option involves a bus from London Stansted (every 60 minutes) via Victoria (every 10 minutes), ending with 1 minute walk. The whole trip lasts for 1 hour and 26 minutes. A Stansted to London Marriott Hotel Park Lane Transfer by car can be done by taking the M11 motorway and then the M25 one. Stansted Airport is at a 47.3 miles distance from London Marriott Hotel Park Lane. This journey will take about 1 hour and 6 minutes, without including traffic. A Stansted to London Marriott Hotel Park Lane Transfer with 247 Stansted Airport Transfer is going to take about 1 hour and 33 minutes, including rush hour traffic. The price for a Stansted to London Marriott Hotel Park Lane transfer starts from 59 GBP.